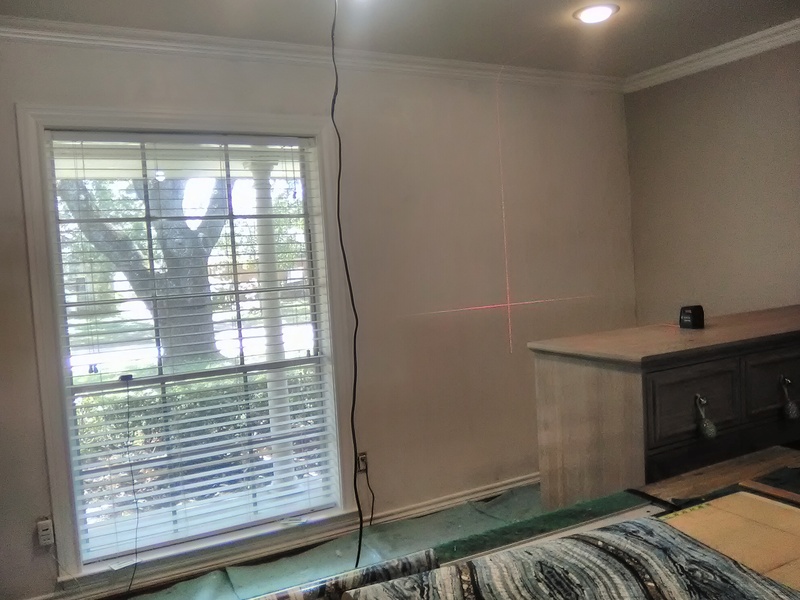 The walls in this newish home in the Rice Military neighborhood of Houston are painted a light brown, and someone had painted this wall in the dining area a darker brown. 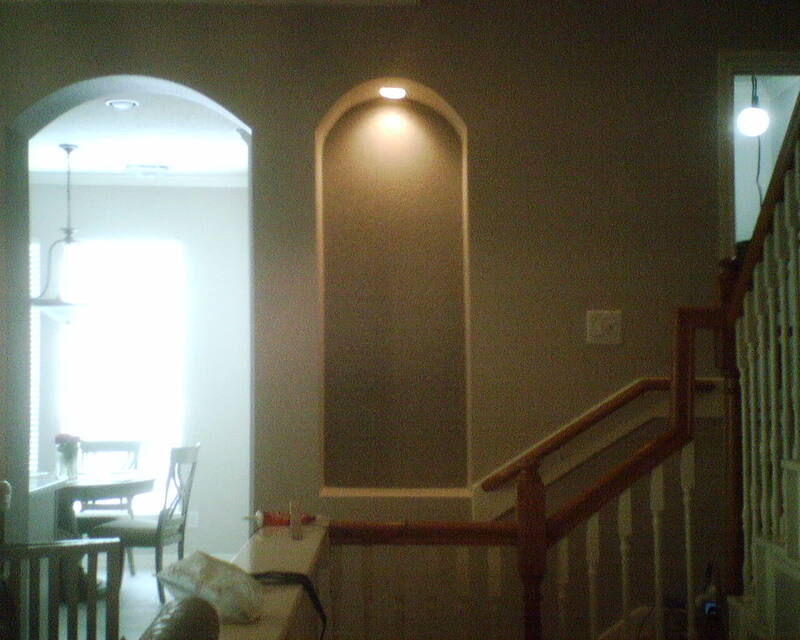 This made it an “accent wall” – but it wasn’t very interesting. 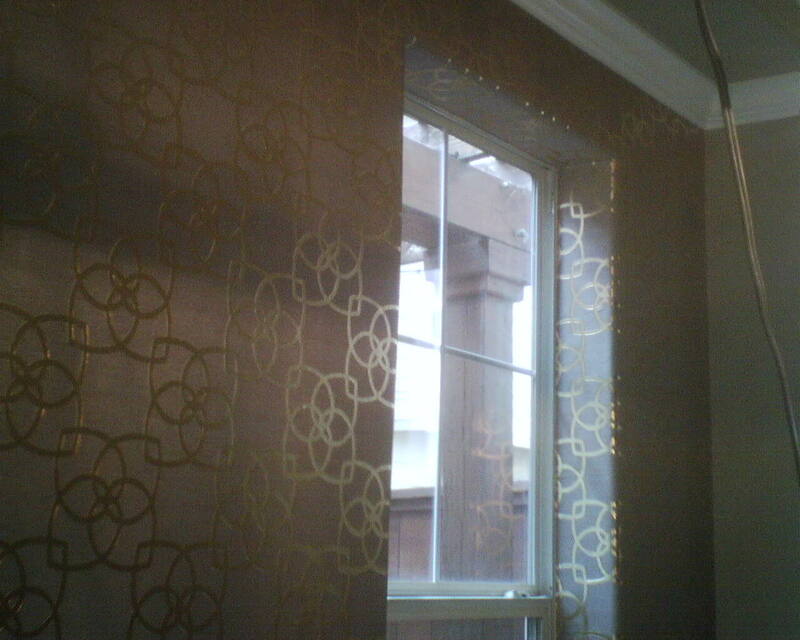 The homeowner knew that some pattern and shimmer would bring life to the room. 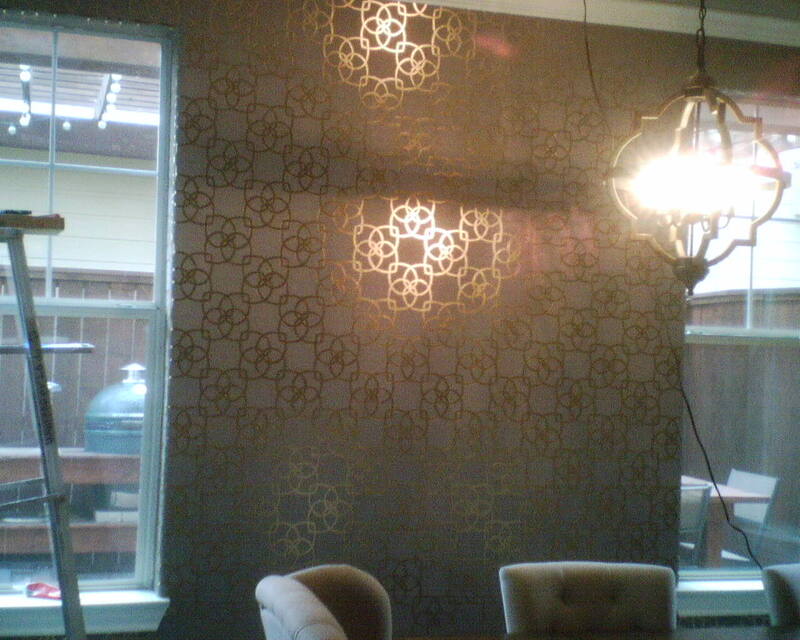 She chose this interlocking geometric design in a shiny brassy finish on a lightly textured bronze colored background that coordinates very nicely with the painted walls. Wow, did this change things! The fluid design interjects personality and a modern feel into the dining and living area, while the glossy lines give a jolt of excitement. You see this wall as soon as you enter the main area of the house, and it really sets a bright, lively, sophisticated feel for the home. 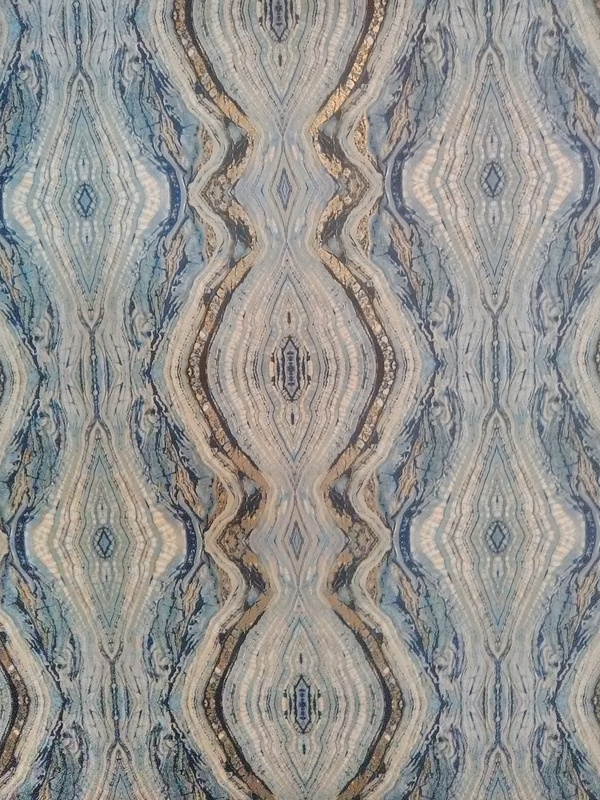 This wallpaper is in the Antonia Vella line by York. 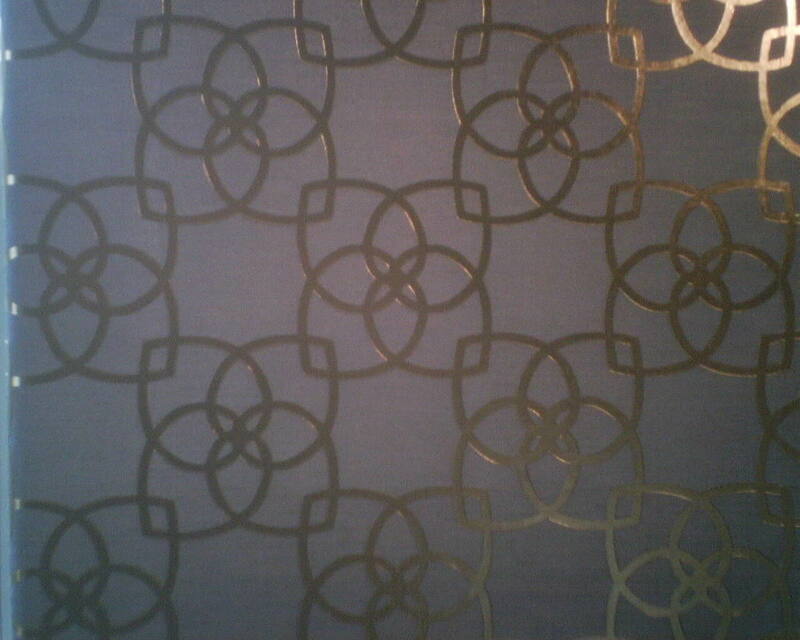 It is a somewhat heavy solid vinyl embossed with texture, on a non-woven backing. It was important to not let any paste touch the front of the paper, because the textured surface would grab and hold the paste, which would show and look bad for – well, for as long as the paper is up on the wall. Other than that, the paper was surprisingly lovely to work with. Those windows with the rounded edges, however, were not so accommodating. 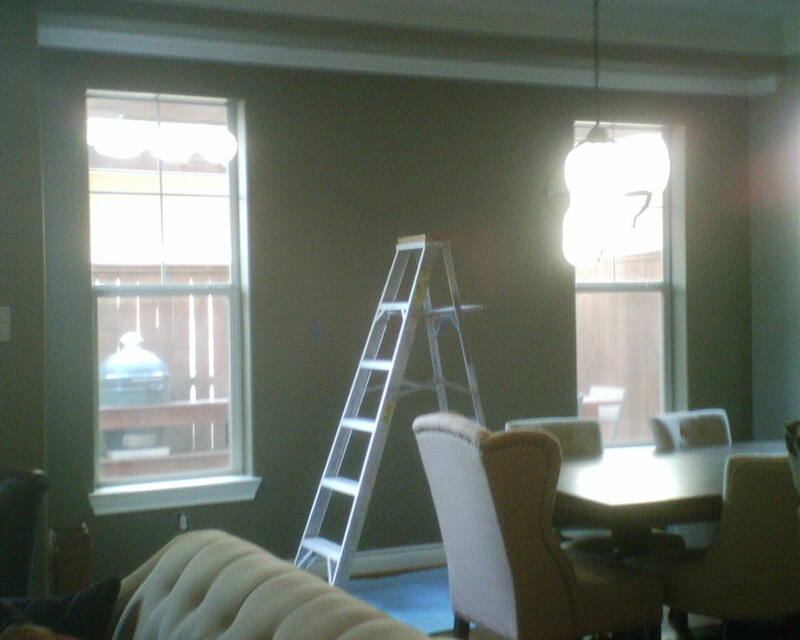 It took me four hours to hang this wall, and most of that time was spent on the windows. 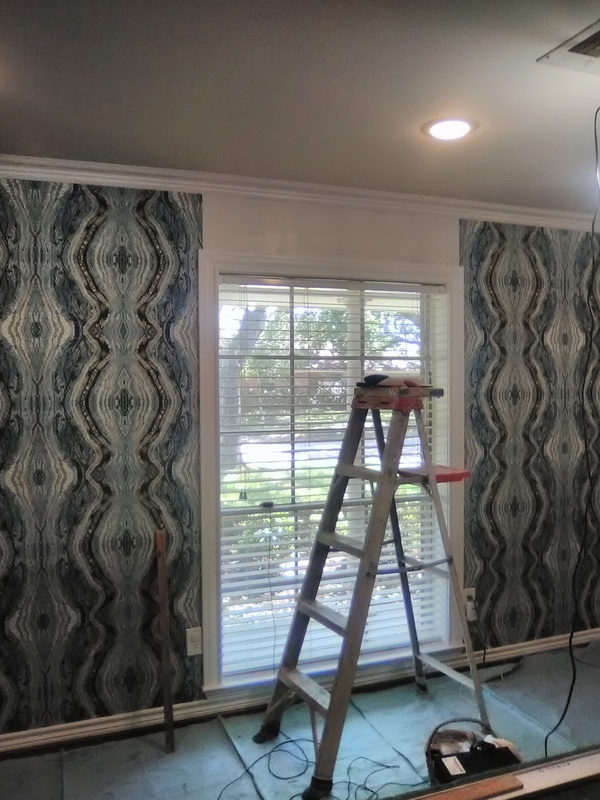 Too complicated to explain the tedious and exacting process, but it was well worth it, because the finished accent wall looks fabulous. 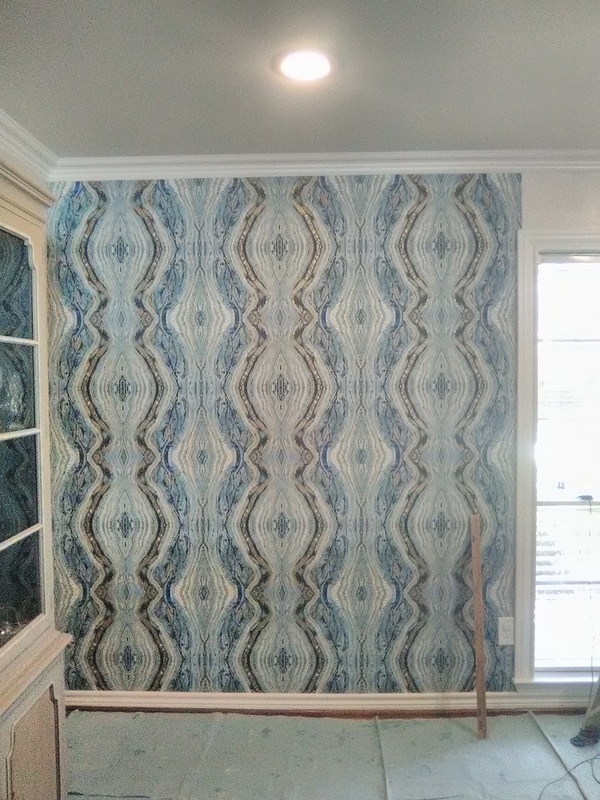 This wallpaper pattern is by York Wall, and was bought at below retail price from Dorota Hartwig at Southwestern Paint on Bissonnet near Kirby. (713) 520-6262 or dorotasouthwestern@hotmail.com. She is great at helping you find just the perfect paper! Discuss your project and make an appointment before heading over to see her. 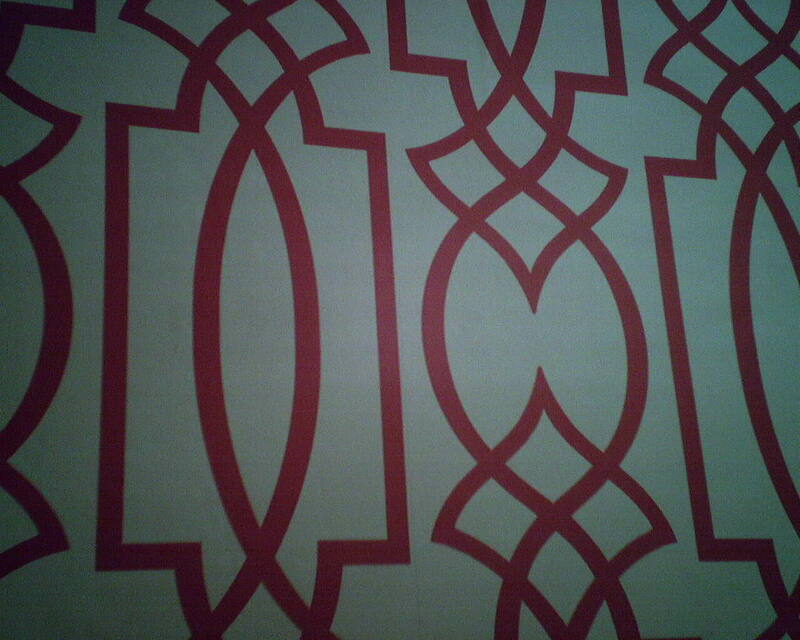 So, O.K., it’s a hard room to photograph. 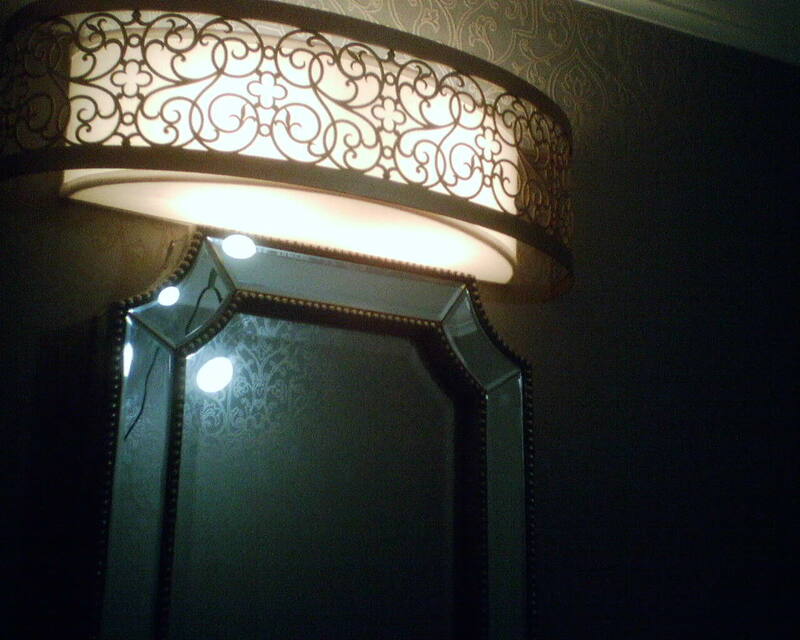 All I can show you is the papered wall behind the beautiful light fixture and the really cool mirror. 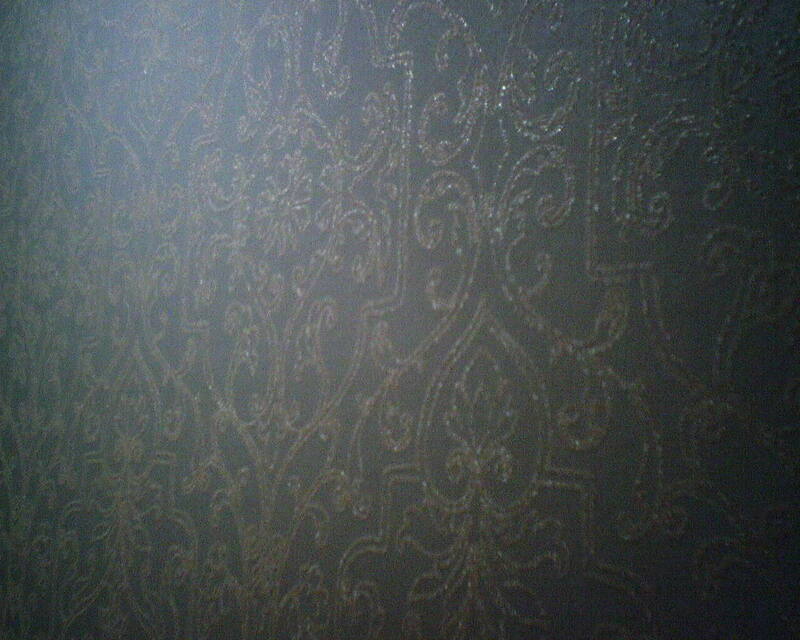 This wallpaper is embedded with tiny glass beads, which give it dimension, texture and sparkle. In the 2nd photo, you can see how the beads shimmer when the light hits them. 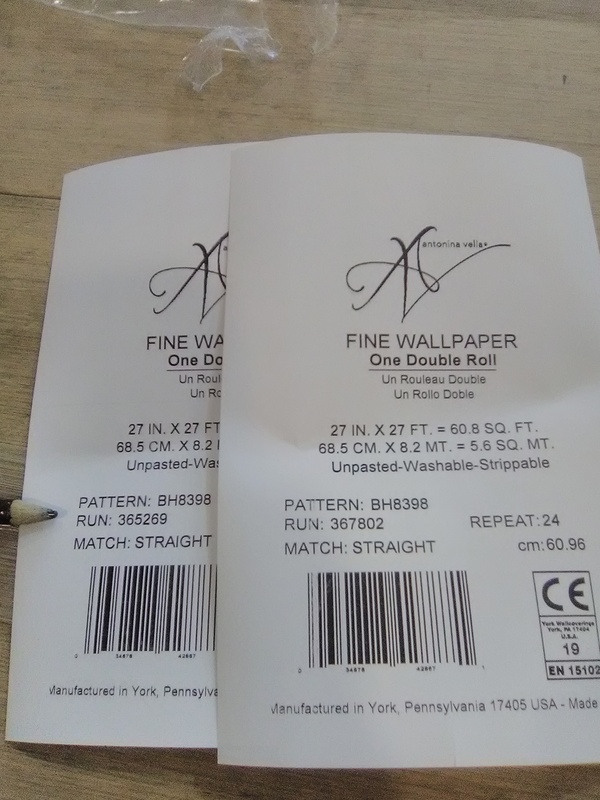 This wallpaper is by Antonia Vella, for York Wallcoverings. 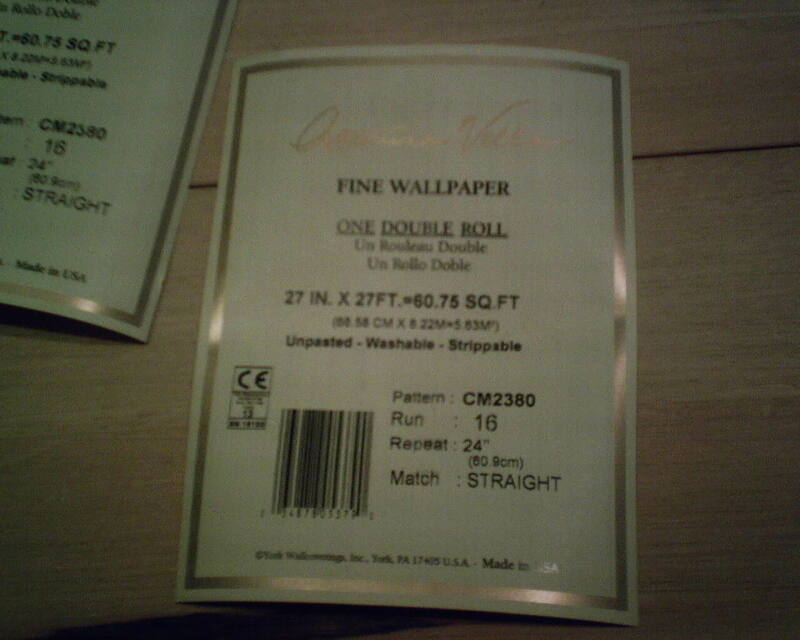 It is a non-woven material and is a paste-the-wall product. It is very thick and stiff, and difficult to manipulate, and very hard to cut through, especially the beads. Used lots of razor blades today. 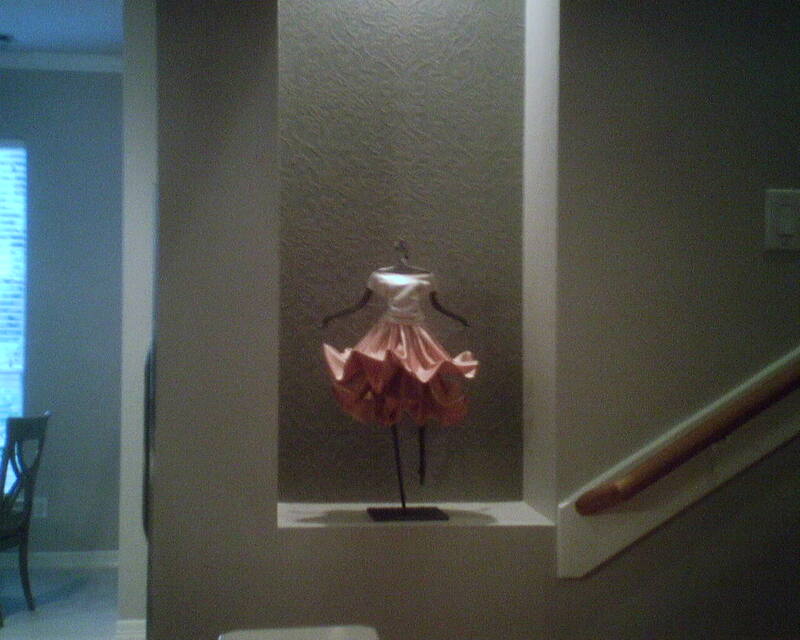 I hung it in a powder room in the Rice Military neighborhood of Houston. 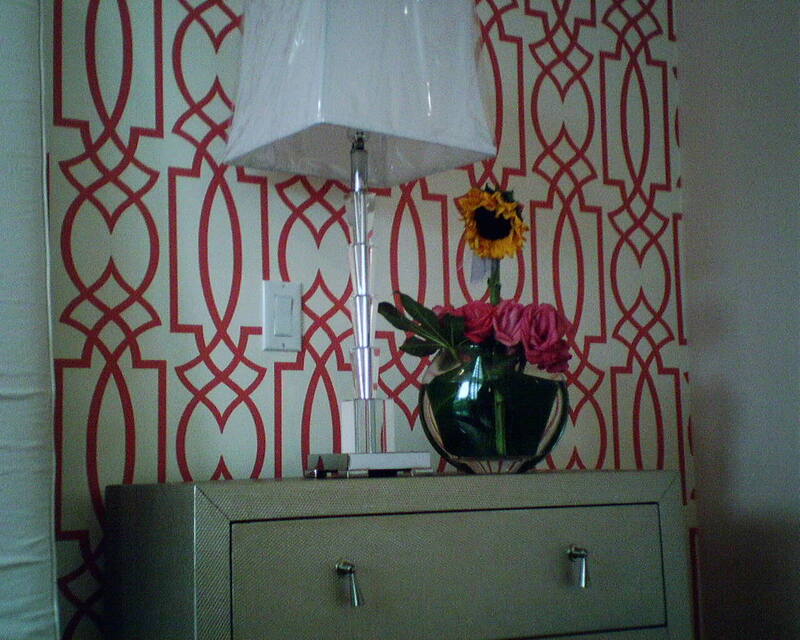 The interior designer is Pamela O’Brien of Pamela Hope designs. I didn’t take a “before” picture, because the bathroom, clad in safe khaki paint, was depressingly boring. The new wallpaper changed all that! Trellises are a popular pattern these days. 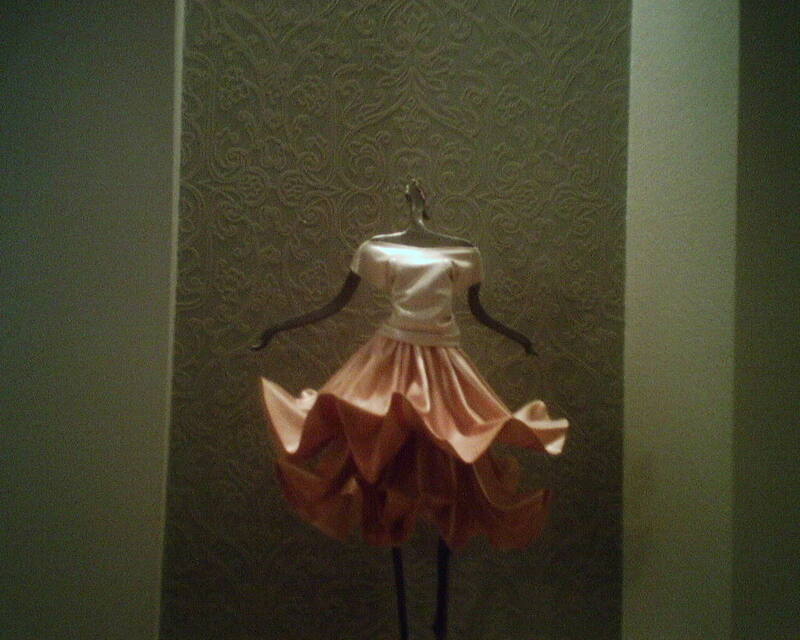 I’ve hung this before in tan-on-white, black-on-white, and in hot-pink-on-white. 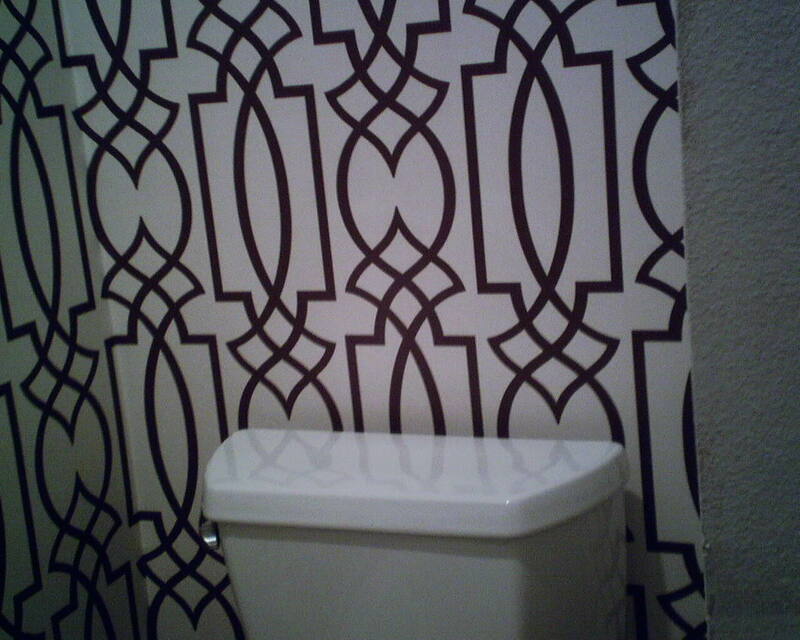 This homeowner opted for a chocolate-brown-on-white. 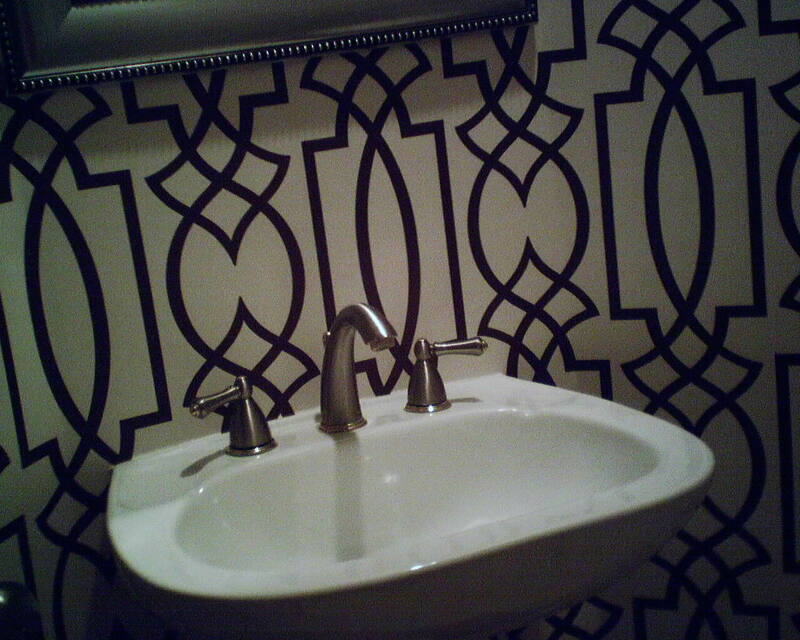 You can see that it looks fantastic in this powder room. 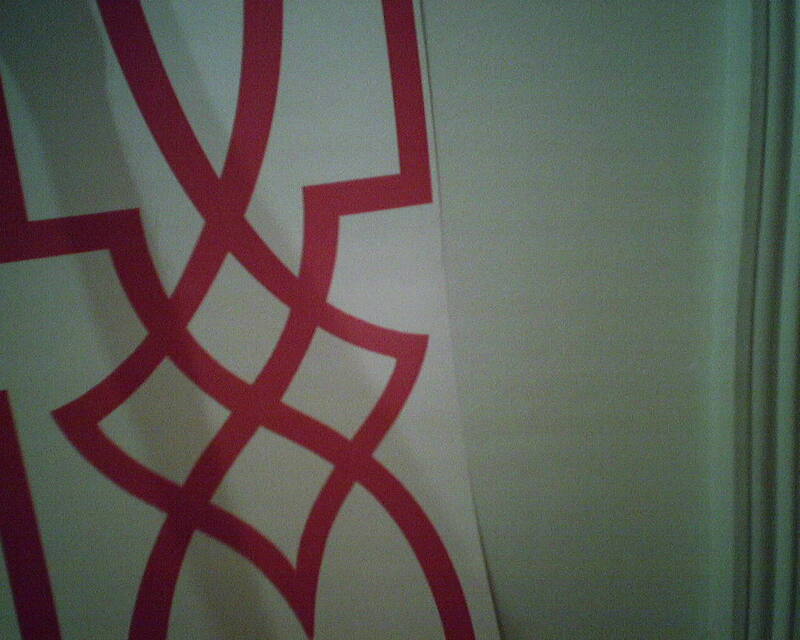 The material was very nice to work with, too. 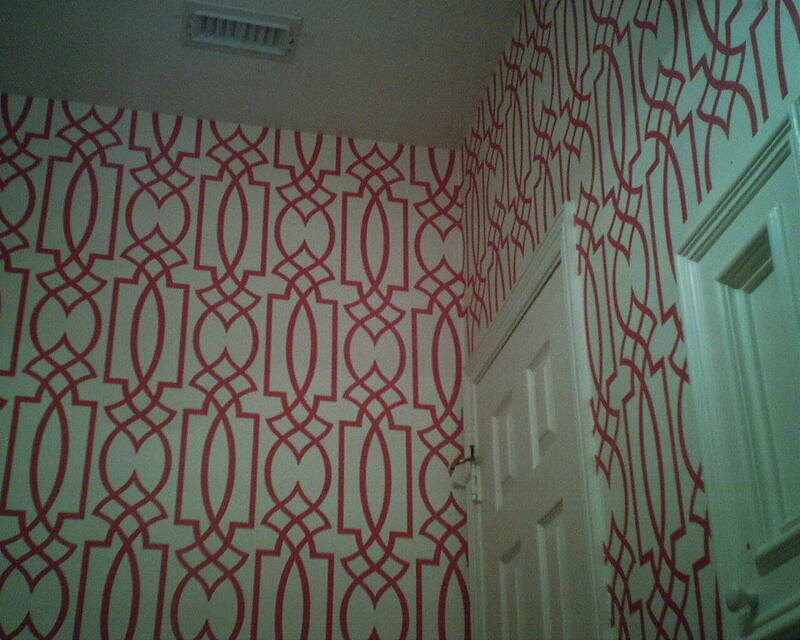 Several years ago, I papered this young girl’s bathroom in West University Place with a sweet yellow and navy floral stripe. It served her well while she was little, but now, as a pre-teen, she needed something a little zippier. This fuchsia trellis really fills the bill. When the gal came home from school, she loved it! 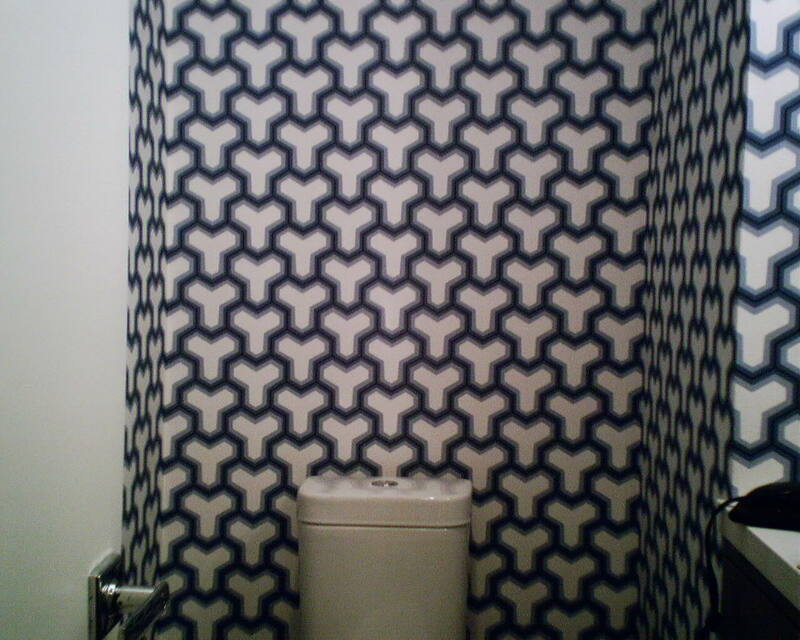 In this case, I chose to center the pattern on the toilet, even though it meant that the pattern would fall unevenly in each corner. As you can see from the strong vertical line shooting from ceiling to dead-center of the toilet, this was the best option! 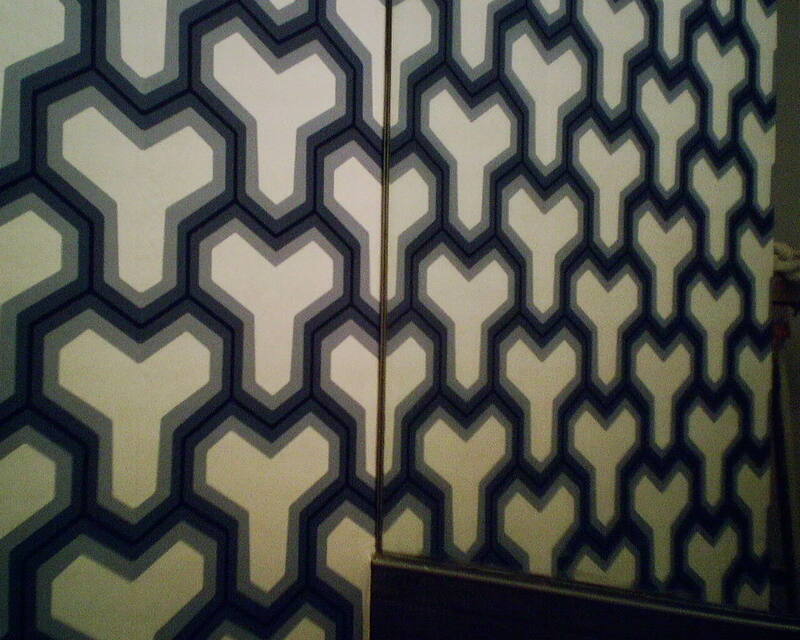 Or, maybe you’d rather see the pattern centered on the wall, so the “Y’s” are equal on both the right and left sides – What do you think? 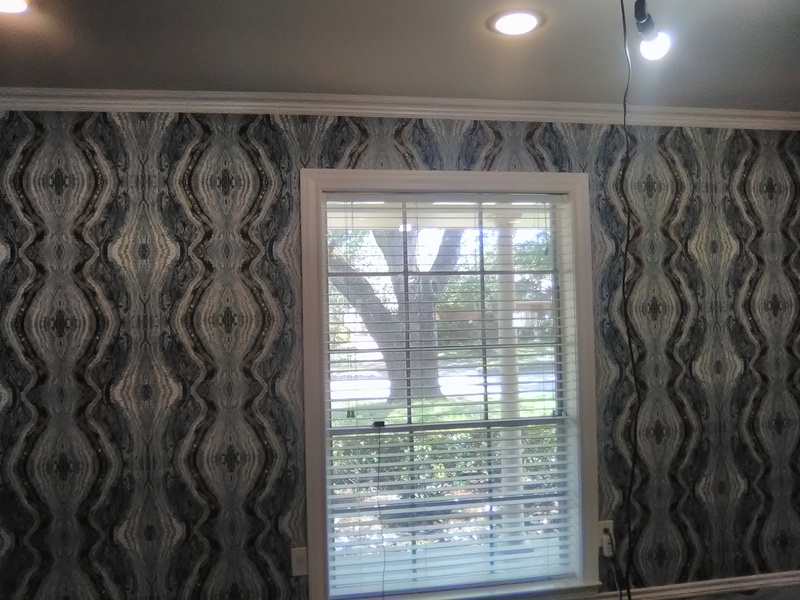 This fun geometric pattern is by Antonia Vella for York Wallcoverings, and was hung in a contemporary new home in the Montrose neighborhood of Houston. 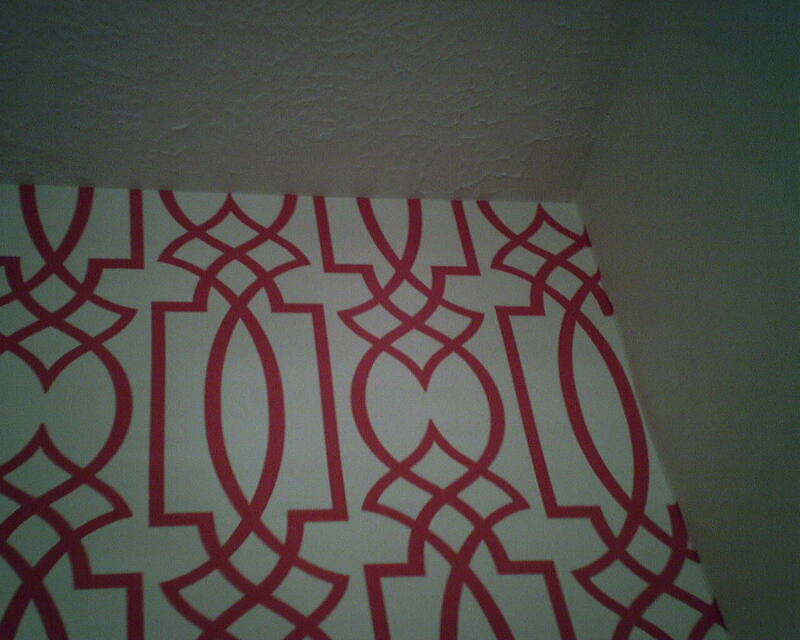 Here are two coordinating wallpaper patterns used as companion papers in a gal’s bedroom and bathroom. Lattice in bedroom: The wallpaper pattern is #CM2382 by designer Antonia Vella for York Wallcoverings, one of my favorite manufacturers. 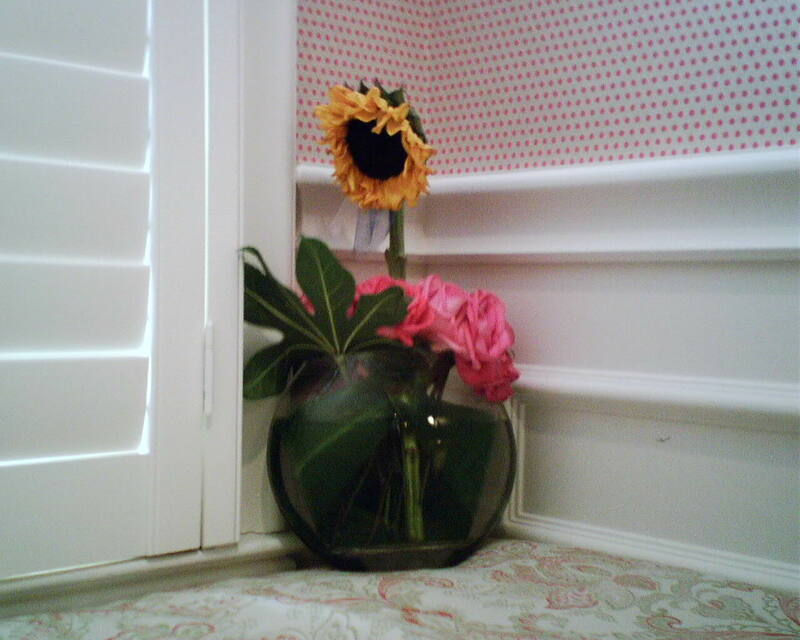 Pink polka dots on silver in adjoining bathroom: #RB4286 from the Sure Strip line by York Wallcoverings. 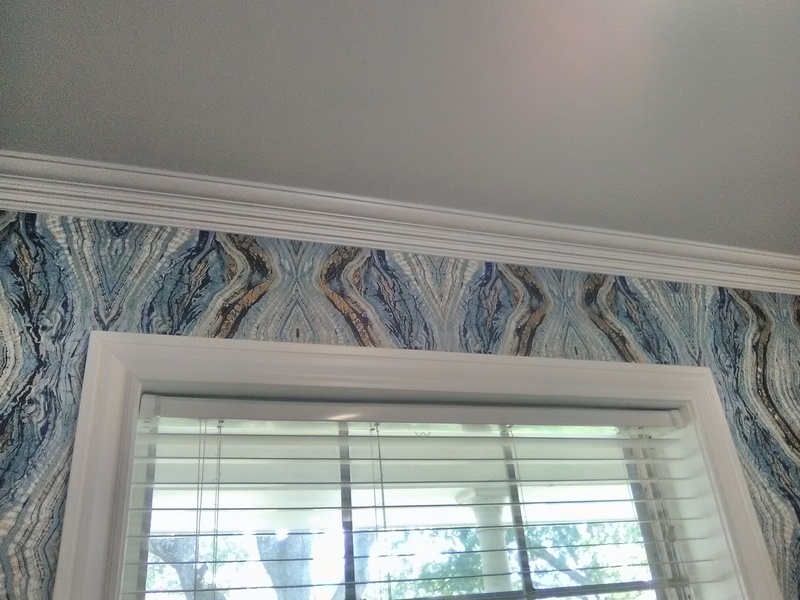 It’s one of their newer non-woven substrates, intended to strip off the wall easily and in one piece, when you’re ready to redecorate. I did this bedroom and bathroom almost a year ago. 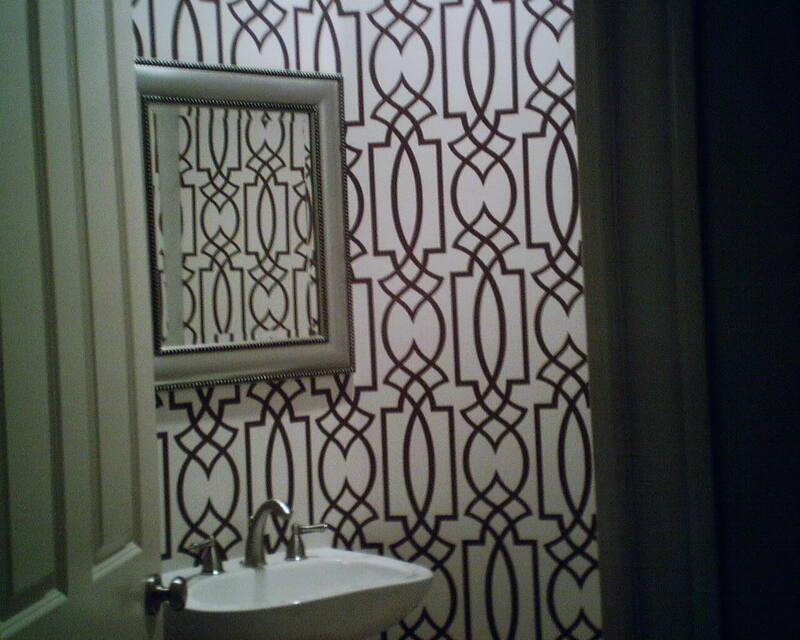 Interestingly, I was back this week to do their powder room and the boys’ bathrooms.